Connecting your Geokon Geonet Nodes to sensemetrics is as easy as turning it on and walking away. Geonet nodes automatically connect to sensemetrics gateway THREADs via the mesh node network and then auto-populate your network. 1. Make sure you have turned on a single gateway thread that is within range of the Geonet node. How to Add a thread can be found in within the link. 6. Toggle the switch to the Position to turn it on. The LED on the right side should flash once. After 2 minutes of boot and the geonet in "Hunt Mode". The geonet will look for a Thread every 10 minutes and then revert to hourly frequency. You are finished! The Geonet Nodes will use the mesh node network to connect to your gateway thread and to your sensemetrics server. You will see the nodes populate on the connection side of Network. *Note: If you are using Lithium batteries, start with the switch on Alkaline then flip to Lithium to turn the node on. The Vibrating Wire Sensor on the Geonet will now need to be configured to the specific VW you are using. Navigate to the device in the Devices & Sensors list on the right hand side of Network and click the Node you wish to configure. Click the "Edit Configuration" button under VW Mux Information. 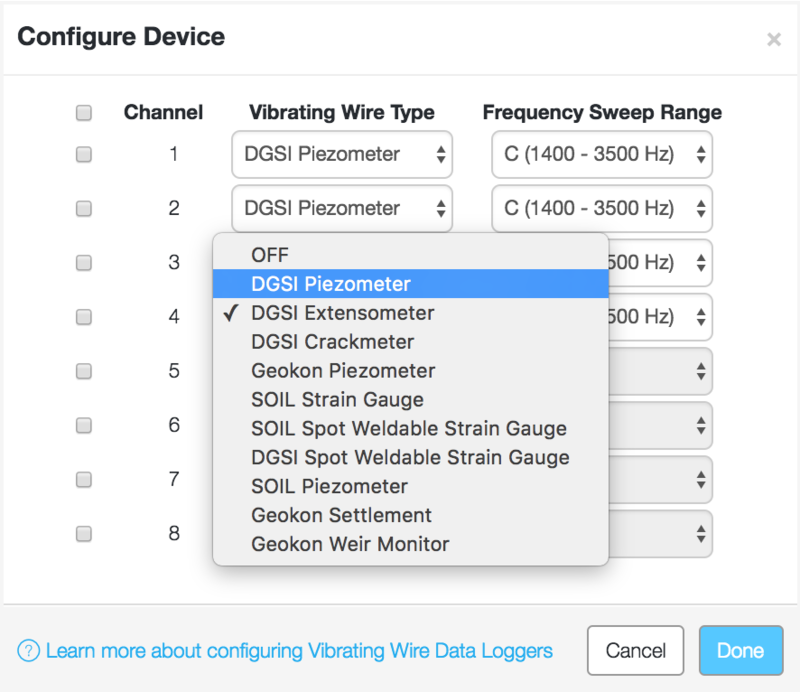 Select the type of vibrating wire that is on channel one and the suggested Frequency Sweep will be automatically filled in. Once saved, the configured vibrating wire sensor will populate beneath the Geonet Device and can be viewed by clicking the drop down arrow. *Note: Geonet Nodes will only upload readings once an hour. The Frequency at which readings are taken can be increased but the upload to the server will only happen once an hour.